I'm so excited to start this adventure with the children of PEI! There is magic in nature. As a small kid growing up in the PEI countryside I climbed trees, swam in streams, & watched the shadows of clouds race by on the hillsides in my valley. My earliest memories are of being fascinated by the tiny life all around me in overgrown meadows and the peace I felt sitting in the tall plants waving in the ever present summer breezes. I counted the tiny white moths, lady-bugs, and earthworms as my friends. I held countless little lives in my hands; toads, frogs, garter and northern redbelly snakes, and my all time favourite; spotted salamanders! Feeling their tiny breathing in my hands I understood their fragility, their vital life, and cared for them deeply. In a time when the lives of many of my peers were moving away from the natural world, I was knee deep in the mud, or sitting in my favourite perch where a spruce and cherry tree grew together in just the right way. I loved nature in every season, going outside in winter storms to build shelters, following spring runoff streams to see where they went, hiding in ferns over my head in the woods, picking wild blackberries in spooky other-worldly thickets. The adventures with siblings and friends were fraught with excitement and peril (mostly imagined) but motivating nonetheless. We relied on our strength and help from each other to overcome obstacles, we discovered and tested our limits both physical and mental. We found opportunities to be brave, fast, dexterous, clever, quiet, sneaky, and learned when to take risks and what consequences looked like. In school I noticed patterns I recognized from nature. The connections between math and physics, biology and sociology jumped out at me and I knew that nature had taught me so many things without my even trying to learn. I knew about patterns, colour, light and darkness, the motions of wind, water, and sound, the strength of stone, wood and plants, the natural behaviours of animals. As a child in the 80's I was aware that many of my peers were living lives with very little natural connections. I spent my fair share of time in basement dens playing video games, building Lego and watching Return of the Jedi repeatedly. I was drawn to these activities, but nothing filled me up the way tearing off into the woods after school did, leaving that world behind and following my senses and my heart into the woods and fields. There isn't much that compares to the feeling that comes from being free to choose a path without any other person's influence. What I found in that space was peace, beauty, love, consequences, and myself. Small people are especially good at following their hearts. They are naturally curious and mostly brave and all of them are amazing. I want to help them hold onto and really value those qualities in themselves. When I take Wild Children into the woods now, my main goal is for them to have fun, to see something new, maybe to see something old in a new way, and to have an adventure. I want them to feel their hearts beating, to ask questions, to really look and listen and feel the world around them. To be awake and engaged and excited! My first few weeks with the amazing small people of PEI have not disappointed. We've created land art, discovered ant cities, practiced tree identification, learned about seeds, been birds and bears, met salamanders, snails and frogs, found shelter on cold windy days, really listened, run a lot, and sometimes gotten very dirty. 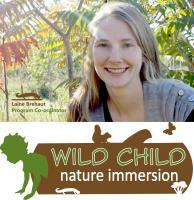 Tomorrow I'm off to Nova Scotia to see the http://www.wildchildforestschool.ca/ in action. Our goal on PEI is to grow our program in a similar way and get as many kids as possible outside the fence as often as possible. I'm excited to see where we'll go together. If I can pass on just a little of the love I have for the natural world, it will be time very well spent. I'm looking forward to learning and growing as a facilitator and want to thank Hanna and Tony and Sierra Club Atlantic for all the work they put into this program and our community funding partners who make it possible for kids from every walk of life to get running in the woods. Special thanks to: The City of Charlottetown, The PEI Wildlife Conservation Fund, and all of our private donors that make our program possible.